Enjoy a once in a lifetime experience! Plan on about 2 hours: From the start of inflation of the Balloon, launch, flight, landing, pack up and return to airport. Flight time varies on weather conditions. Generally, flights are 30 to 60 minutes. Heat, winds and landing areas affect the length of time you are in the air. If a flight is cancelled, your ride fee will be refunded. If you paid for the ride with a credit card, you will need the same card to receive the refund. We cannot refund to a different card. The minimum age is 10 years old and must be accompanied by a parent. We encourage riders wear tennis shoes and all cotton outer wear. Nothing nylon or polyester. All baskets have a maximum capacity of passengers allowed using a weight (payload) limit defined by the balloon manufacturer. Basket sizes commonly registered for the event usually accommodate between 1 and 5 passengers depending on the above stated limits. Flights can be purchased at the Festival grounds, Balloon Ride Tent. They can be pre purchased prior to August 15 by completing the form on our website. See “Fly with us” on left column of website. The NYSFOB is considered by The Federal Aviation Administration as an Airshow and dictates parameters for safe flights. Though numerous technical factors apply, weather is the primary one deciding a launch. Winds must be under 8 knots and NO storm activity within 45 miles at launch time. Morning launches occur just after sunrise and all evening flights must be on the ground by sunset. 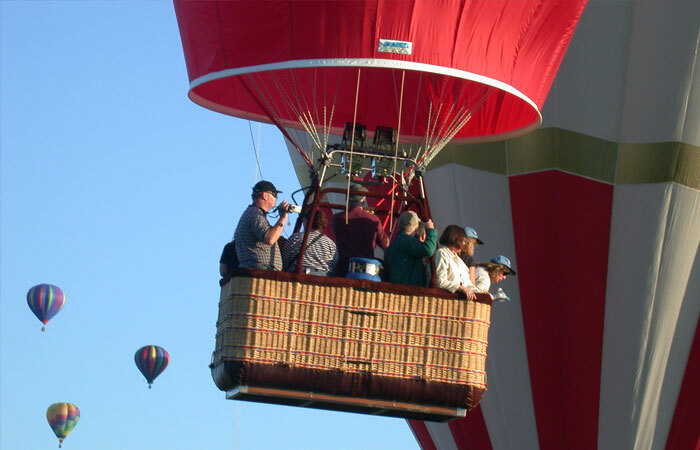 Our Balloonmeister is the FAA official with sole authority to authorize a GO/NO GO flight. Ballooning is a 100% weather conditional sport. Our pilots come here and truly want to fly for the benefit of the NYSFOB. They will wait until the last possible timing opportunity to launch their balloons, so long as the conditions are safe for person and aircraft. The only flights that will occur are those with SAFETY considerations established as the top priority. Pre-sales will close August 15th, but rides will be available to purchase at the ride tent at the festival! While the sport of hot air ballooning can be exciting, adventurous and beautiful, passengers are exposed to above average risk of injury. While pilots take precautions to provide for a safe flight it is impossible to guarantee absolute safety. You are requested to sign a Waiver and to surrender the Ticket to your pilot prior to your flight. Your attention is specifically drawn to the paragraph identified as “All Passengers Must:” on the back of the document. If you feel uneasy or unsuited in a balloon, please do not fly.